Masters: What happens when you get to Augusta National and it rains? AUGUSTA, Ga. – As rain dropped all around him, George Wunder stood and peered wantingly over a fence into the weather-closed grounds of Augusta National Golf Club. He was living a question no golf fan ever wants to ponder. What happens when you spend your entire life dreaming of coming to the sacred golfing grounds of the Masters, you finally win a precious day pass via the long, lightning strike-odds of the ticket lottery and then … lightning actually strikes and they have to close the place? 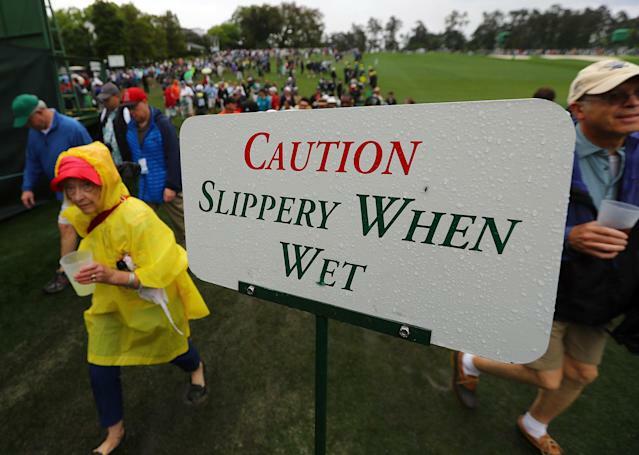 The course opened to the patrons, as the Masters refers to fans, at 8 a.m. Tuesday, but at 10:05 the weather got nasty and everyone was told to leave for safety’s sake. Just like that, thousands of pilgrimages here were put on hold. The scene outside the gates were of golf fans such as Wunder who were making their first visit here. They killed time pacing about, praying for sun and thus a reopening, while trying to stave off disappointment with an appreciation that, hey, at least they got a couple hours on the inside. Oh, and there was lots of gallows humor. Lots of it. What did Wunder first think when he heard the weather horn blow that called for evacuation of the grounds? “[Expletive,]” he said, with a laugh. “I just started crying,” said George’s brother, Nick, who along with George’s son, Justin, and wife, Amy, traveled down here from outside Baltimore for what is often a once-in-a-lifetime opportunity. Fans around the world, just like the Wunders, grow up watching the Masters on television and form a bond with the place. It is the only major championship that is staged on the same course each year. The club’s exclusive access makes it even more mystical. So is the limited television broadcasts – focused mostly on the back nine. Everyone wants to come here and see it, even for the early week practice rounds. It’s why tickets for Wednesday’s session were fetching $3,000 on the secondary ticket market. Yes, three grand and it’s not even the actual Masters. So whether they doled out big money (Tuesday’s round were fetching around $1,500) or won the annual Masters ticket lottery, the opportunity is treasured. They make special trips from around the globe, often with the parents or grandparents that introduced them to the game or the children and grandchildren they hope will embrace it like them. “The bucket list,” said Julie Cousineau, who was there with her husband Luke. Like the Wunders, they were stuck Tuesday morning in fan purgatory. The promised land was right there, over the fence. Yet they were stuck milling about, piecing together gossip about a possible afternoon reopening of the gates. Because Augusta National prohibits cell phones on its grounds, information was scarce. No one could scan radar on weather apps or refresh Twitter for the Masters feed. All they could do was sit and wait and share their shared misery. When the Cousineaus, for instance, found out they won two passes in the lottery, they rejoiced and celebrated. “I’m a big fan, always have been,” Luke said. They planned a trip from their home in Ottawa, Ontario. Monday night they stayed in Aiken, South Carolina, because hotels in Augusta were too expensive – “They wanted $400 for the Motel 6,” Luke marveled. They got up early Tuesday and arrived on the grounds hopeful for a full day of exploration. They hit the gift shop – the only place in the world that sells official Masters merchandise and is open only this week. They gazed at the huge hills that TV can’t do justice. They stopped for a $1.50 egg sandwich, part of the stubbornly reasonable concessions here. While the rain kept falling hard upon arrival and keeping most golfers from practices, the Cousineaus were undeterred. They began a march to the far reaches of the property, Amen Corner, the famed stretch that includes the 11th, 12th and 13th holes and is bisected by the bubbling waters of Rae’s Creek. It earned its nickname from sportswriter Herbert Warren Wind when chronicling Arnold Palmer’s 1958 victory here. That’s when the horn blared. There is nothing anyone can do about the weather. A retractable roof over a golf course wouldn’t just be ridiculous, if not impossible to construct, but might even break Augusta National’s considerable bank. Sometimes it rains and storms. Those azaleas don’t bloom by accident. While everyone waited, scanning western skies for the slightest bit of brightening clouds, they contemplated their gameplan if the course reopened. The Cousineaus said they’d head right to Amen Corner. The Wunders, who got to walk most of the back nine before the weather closing, wanted to hit the gift shop and then see as much of the front as possible. George Backus and his wife Robin came down from Mamaroneck, New York, having scored practice round tickets after five years of lottery futility. George had been in 1992, but says he was young and didn’t appreciate it because he was partying and just having fun. Now he’s a more serious golf fan, as is his wife, so this trip was different. Everything was just a couple feet away, yet all they could do was hang out and wait and talk about the moments they did have, even as if each minute that melted away was painful. The Wunders, for instance, entered the lottery for 15 consecutive years before finally getting their four Tuesday badges. Who knows when they might win again? At least, Amy Wunder said, they got to try the pimento cheese sandwiches. “They were good,” she said. Down the walkway a giant sign began flashing an update – weather was said to be improving, gates might open at 12:45 p.m. Suddenly there was hope. Sure, there’d be almost no actual golfers practicing on the course at that point but everyone could get to Amen Corner, get to that gift shop, get to this magical place they dreamed of so many times. Moods improved. So did the weather. Just like the sign predicted, the gates to golfing heaven reopened.